A provocative, unprecedented anthology featuring original short stories on what it means to be an American from thirty bestselling and award-winning authors with an introduction by Pulitzer Prize–winning author Viet Thanh Nguyen: “This chorus of brilliant voices articulating the shape and texture of contemporary America makes for necessary reading” (Lauren Groff, author of Fates and Furies). When Donald Trump claimed victory in the November 2016 election, the US literary and art world erupted in indignation. Many of America’s preeminent writers and artists are stridently opposed to the administration’s agenda and executive orders—and they’re not about to go gentle into that good night. In this “masterful literary achievement” (Kurt Eichenwald, author of Conspiracy of Fools), more than thirty of the most acclaimed writers at work today consider the fundamental ideals of a free, just, and compassionate democracy through fiction in an anthology that “promises to be both a powerful tool in the fight to uphold our values and a tribute to the remarkable voices behind it” (Anthony D. Romero, executive director of the ACLU). 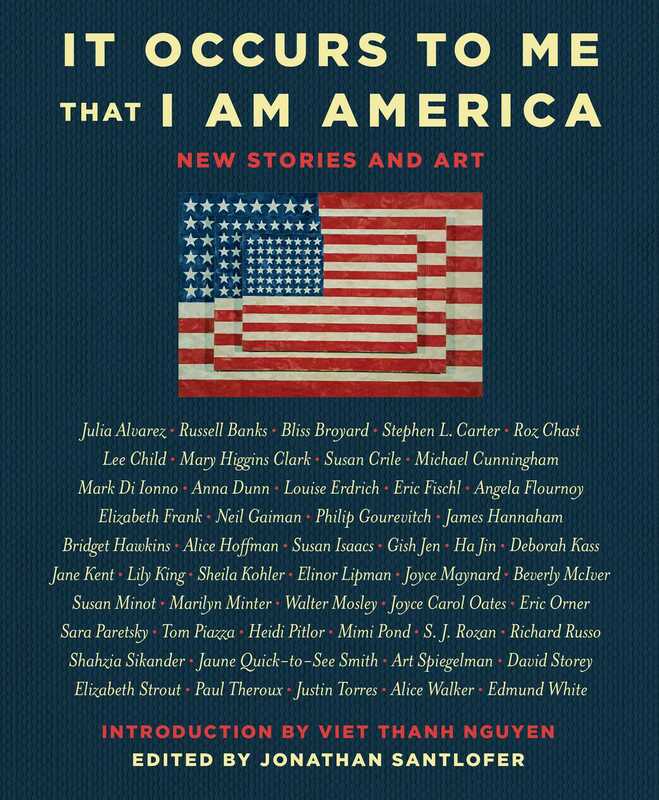 With an introduction by Pulitzer Prize-winning author, Viet Thanh Nguyen, and edited by bestselling author Jonathan Santlofer, this powerful anthology includes original, striking art from fourteen of the country’s most celebrated artists, cartoonists, and graphic novelists, including Art Spiegelman, Roz Chast, Marilyn Minter, and Eric Fischl. Transcendent, urgent, and ultimately hopeful, It Occurs to Me That I Am America takes back the narrative of what it means to be an American in the 21st century. I am a writer, and like all writers, I believe in the power of stories. My first love was literature, especially fiction, and so I was thrilled when I was invited to write a few words to introduce this anthology, which is about the power of fiction to shape and to state who we are. I have a daily reminder of fiction’s enduring magic, delivered to me by my son. He is four years old. Every morning and evening I read to him. I love the joy he takes in learning new words, immersing himself in stories, seeing himself as the characters, and acquiring a moral and ethical sense. He lives in a fictional world of good and bad, of threat and rescue, of the choice between doing good and doing harm. When I was his age, I had just arrived in Harrisburg, Pennsylvania. It was 1975. I was a refugee and the child of refugees who had fled Vietnam. My parents had neither the time nor the ability to read to me in English. So I took refuge in the local public library. It became my safe space and books my constant companions. I imagined myself amid the wonders of Manhattan, the bucolic splendor of midwestern farms, the stirring and dreadful times of the American Revolution and Civil War. Even if there was no one who looked like me or had a name like mine, through these stories, I became an American. As I remembered this during our most recent presidential election, what became clear to me was that the contest for our American identity isn’t strictly a political affair. It is also a matter of storytelling. Those who seek to lead our country must persuade the people through their ability to tell a story about who we are, where we have been and where we are going. The struggle over the direction of our country is also a fight over whose words will win and whose images will ignite the collective imagination. Donald J. Trump won barely, and by the grace of the Electoral College. His voters responded to his call to “Make America Great Again,” referring to a past when jobs were more plentiful, incomes more stable and politicians more bold. That kind of nostalgia is powerful and visceral, but it’s hard to ignore the subtext. America of the golden age, if it ever existed, kept women out of the workplace, segregated and exploited minorities and restricted immigration by race. It’s hardly surprising that the population of much of the literary world is terrified by Mr. Trump’s vision of good versus evil, us against them. At the ceremonies for the National Book Awards and Dayton Literary Peace Prizes of 2017, most of the speeches proclaimed opposition to the values that Mr. Trump espoused. That opposition isn’t just political but literary: his story contradicts the idea of literature itself. Great literature cannot exist if it is based on hate, fear, division, exclusion, scapegoating, or the use of injustice. Bad literature and demagogues, on the other hand, exploit these very things, and they do so through telling the kinds of demonizing stories good literary writers reject. The cast of the Broadway musical Hamilton sought to remind then vice president elect Mike Pence of this when he attended the show soon after the election. They implored him directly to defend American diversity. When an offended Mr. Trump tweeted that the theater “must always be a safe and special place,” he missed their point: America itself should be a safe and special place. Part of the fault is ours; too many writers are removed from the world of our readers. After my novel The Sympathizer was published, I would get letters from people who accused me of being “ungrateful” to the United States. The places where the book was most popular were the Northeast, West Coast and big cities. A vast section of rural Americans in the Deep South, heartland and North were not buying the book. Despite that criticism, this election reminds me of the necessity of my vocation. Good writers cannot write honestly if they are incapable of imagining what it is that another feels, thinks and sees. Through identifying with characters and people who are nothing like us, through destroying the walls between ourselves and others, the people who love words—both writers and readers—strive to understand others and break down the boundaries that separate us. Fighting the power is what the American Civil Liberties Union has done for nearly one hundred years. I am proud that one of my Berkeley classmates, Cecillia Wang, is a deputy legal director for the ACLU. She was an English major, like me, and it is no coincidence that the love of literature has some relationship to the love of justice and liberty. Such love is not partisan, but is a matter of principle, which is why the ACLU has worked with and battled against American presidents of both parties to ensure that our country makes good on its founding premise as the land of the free. After election night, during which my partner, my graduate students and I drank two bottles of Scotch, I renewed my commitment to fight for freedom and to fight the power. That was always my mission. I was thinking of it when I named my son Ellison, after the novelist Ralph Waldo Ellison, himself named after the philosopher Ralph Waldo Emerson. Making my son a part of this lineage, I wanted him to understand the basic paradox at the heart of literature and philosophy: even as each of us is solitary as a reader or a writer, we are reminded of our shared humanity and our inhumanity. My son need not become a writer, but he will become a storyteller. We are all storytellers of our own lives, of our American identities. I want my son to rise to the challenge of fighting to determine which stories will define our America. That’s the choice between building walls and opening hearts. Rather than making America great again, we should help America love again. This is what the writers and artists in this collection do, through their insistence that each of us is a part of America.